Signed and dated l.l., brown paint "S Melton Fisher '89". A Lys Baldry, The Studio , 'The Paintings of S Melton Fisher', London, Dec 1907, pp 173–82: p 181. A C R Carter, Art Journal , 'Mr Melton Fisher and his work', London, Aug 1899, pp 235–39: pp 236–37, illus p 235. 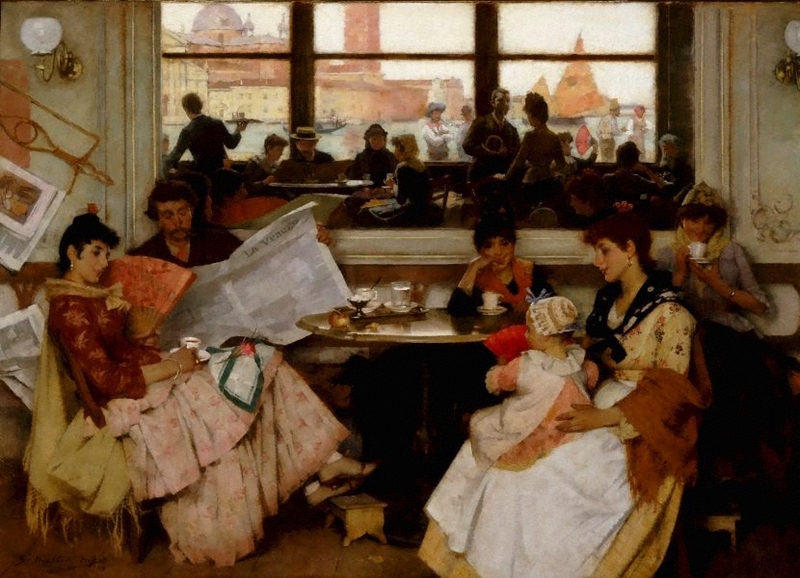 As 'Festa, the interior of a Venetian cafe'. AB Daryll, Magazine of Art , 'Our rising artists: S Melton-Fisher', London, 1902, pp 145–51: p 149, illus p 145. Renée Free, Art and Australia, vol 10, no 1 , 'European Collection', Sydney, Jul 1972, p 64. Art Gallery of New South Wales special number. William Moore, Studio , 'The public art galleries of Australia', London, Apr 1913, pp 202–13: p 210. Tom Roberts, Argus , 'The National Art Gallery of New South Wales', Melbourne, 31 Oct 1891, p 4. The exhibition of the Royal Academy of Arts, MDCCCLXXXIX, the one hundred and twenty-first , London, 1889, p 19, no 514. Pall Mall Gazette “Extra” , London, 06 May 1889, illus p 52. Sydney Morning Herald , 'Art, music and the drama', Sydney, 26 Apr 1890, p 7. Saturday Review , ‘The Royal Academy – III’, London, 18 May 1889, pp 605–06: p 606. Athenaeum , 'The Royal Academy (first notice)', London, 04 May 1889, pp 572–74: p 572. Art Journal , 'The Royal Academy', London, 1889, pp 217–20: p 218. Exhibition of British art by the Royal Anglo-Australian Society of Artists , Sydney, 1890, p 19, no 54. Crystal Palace, Sydney. Exhibition of British art by the Royal Anglo-Australian Society of Artists , Melbourne, 1890, p 16, no 30. Exhibition Building, Melbourne. Sydney Morning Herald , 'Review of the year artistic', Sydney, 31 Dec 1890, p 10. National Art Gallery (report of trustees for the year 1890) , Sydney, 1891, p 1. Exhibition of the British art gallery by the Royal Anglo-Australian Society of Artists, with which is associated the German art gallery, and a selection of pictures by Australian artists: illustrated catalogue , Melbourne, 1892, p 29, under no 72. Sydney Morning Herald , 'Mr Villiers on local art', Sydney, 25 May 1895, p 6. Sydney Morning Herald , ‘National Art Gallery – the interchange question’, Sydney, 15 Oct 1895, p 3. Catalogue of the second interchange loan collections of oil paintings and water-colour drawings exhibited in the Sydney, Melbourne and Adelaide Galleries, April 1896 , Sydney, 1896, p 65, no 3, illus p 65. The Royal Academy of Arts: a complete dictionary of contributors and their work from its foundation in 1769 to 1904 , London, 1905-1906, vol 3, 1905, p 117. National Art Gallery of NSW: illustrated catalogue , Sydney, 1906, p 36, no 92. Picture study in schools – records of the Education Society, no 7 , Sydney, 1913, pp 56–57, illus p 56. Times , 'New Royal Academician', London, 27 Apr 1917, p 3. National Art Gallery of NSW: illustrated catalogue , Sydney, 1917, p 34, no 83, illus p 34. National Art Gallery of NSW: illustrated catalogue , Sydney, 1924, p 55, no 149. Times , 'Mr Melton Fisher, RA: portrait painter', London, 07 Sep 1939, p 8. An exhibition of a selected number of subject pictures belonging to the national collection, typescript exh cat , Sydney, Jul 1943, p 3. Sydney Morning Herald , ‘The Royal Anglo-Australian Society’s pictures’, Sydney, 13 Aug 1890, p 8. Art Gallery of New South Wales annual report 2004 [for the year ended 30 June 2004] , Sydney, 2004, p 70. Loan. Seventh autumn exhibition , Manchester, 1889, p 25, no 252. Illustrated Sydney News , 'Notes on art', Sydney, 07 Jun 1890, p 24. British painting 1800–1990 in Australian and New Zealand public collections , Sydney, 1997, p 80, no 656. Art Gallery of New South Wales catalogue of British paintings , Sydney, 1987, p 61, illus p 61. Academy notes 1889 with illustrations of the principal pictures at Burlington House , London, 1889, p 49, no 514, illus with sketch p 49.